Apple iPhone 6S review | What Hi-Fi? Apple’s slogan for the iPhone 6S is “the only thing that’s changed is everything”. We’re not sure that statement would hold up in court, but what certainly hasn’t changed is Apple’s undeniable way of making a great handset even better. ‘If it ain’t broke, don’t fix it’ is a phrase not often appreciated in tech circles. We all love a fresh new look to go with our fresh new gadget, but you won’t get that here – the 6S looks nigh on identical to last year’s model. That means the same super slim body, the same perfectly curved edges and the same premium metallic frame. It looks just as good now as it did when it launched on the iPhone 6 last year, and we’re not mad at Apple for sticking by it. What you won’t see is what’s gone on underneath the surface. It’s now made from much stronger 7000 Series aluminium, also found in the Apple Watch, used here to prevent any chance of *whisper it* Bendgate Mark II. There’s also reportedly hardier glass on the screen to protect better it from knocks and drops, but a braver reviewer than us will have to do a drop test to check those claims. It’s a touch heavier at 143g, but nothing that you’d notice, and comes in fractionally thicker at 0.2mm. That’s down to the new glass used with Apple’s new 3D Touch feature (more on that later). Three previous colours are available – Space Grey, Silver and Gold – with the addition of ‘Rose Gold’ in the 6S. Also known as pink. 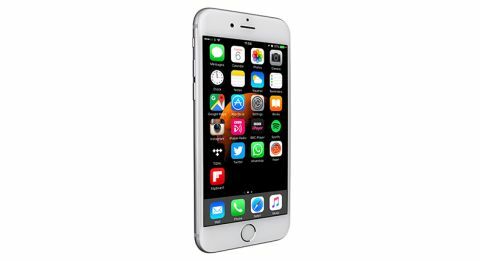 When it comes to performance, Apple has souped up the iPhone 6s with its new A9 processor, a 64-bit, 1.8GHz dual-core chip supported by 2GB RAM. The M9 co-processor is also on board as co-pilot, which helps with things like the ever-aware Siri, which you can now wake from standby with a “Hey Siri” command at any time. As for the experience moving around the phone, it’s as slick and smooth as ever. Switching between tabs in Safari is quicker now, thanks to less page reloading, and multitasking is equally lag free. Games play smoothly and without stutter, and menu swipes and prods are instantly responsive, proving it’s business as usual for Apple’s device. One particular noteworthy speed improvement is the faster TouchID fingerprint scanner. It now reads your fingerprint almost in the same instant as you press the home button to wake the phone, meaning it’s one smooth transition that’s as accurate as always. Time was when we considered TouchID a gimmick, but now we can’t imagine unlocking our phone any other way. Speaking of gimmicks, there are a number of additions to the iPhone 6s that could be seen as just that from the outside. But start using them and you soon realise they enhance the experience. We’re talking about 3D Touch – a new screen feature on the 6S that is able to detect pressure and react depending on how much pressure you apply. There are a few ways that this is implemented across the phone. Firstly, press down firmly on an app icon that supports 3D Touch and you’ll get a vibration from the iPhone’s taptic engine to let you know its been registered (you’ll also get slightly different vibration from a non-3D Touch app to let you know there’s nothing there for now). At the same time as the feedback, you’ll get a small menu with a list of options that you might want from that app. For example on the camera, you’ll be offered choices like take a selfie or film a video, while messages will offer you an option for a new message alongside three of your most regular contacts for quick access. The best thing is, the whole process is intuitive, so the options will change to more relevant things as it learns more about you and what you do most. While it is mostly Apple’s own apps that support 3D Touch right now, the SDK for 3D Touch is open and available to third party apps, so we’re expecting to see much wider support in the future. Instagram and Twitter have already worked the functionality into their processes, and no doubt there will be more to follow. Apple showed off 3D Touch-based games during the iPhone keynote, so we’re looking forward to seeing how far it can go. That’s one part of 3D Touch – the other is the rather saccharinely named ‘Peek and Pop’, which works with the likes of photos, emails and messages. The ‘peek’ part involves you using the same level as pressure as before to preview something like an email or message, getting a quick look at the content without it being marked as read. While you’re holding it in peek mode, you can perform further tasks, swiping up for more options, like reply or forward, left to delete or right to mark as read. This also works with dates sent in messages, for example. Peeking will bring up your calendar on that date so you can see if you’re free, while a phone number allows you to add it to your contacts. As ever, the rule of thumb is that you can generally interact with anything underlined in blue. The ‘pop’ simply adds an extra level of pressure to your peek, which will then ‘pop’ the content into a full screen window for you to action it as usual. As you’d expect from Apple, it all works perfectly, and once you start to use it, you realise how useful it is. Undoubtedly a worthy headline feature of the phone, we can’t wait to see how it develops. 3D Touch aside, the iPhone’s screen remains the same 4.7in Retina display from last year, offering 1334 x 750 resolution and 326ppi. Only being able to display in 720p is becoming to look a little old on the spec sheet when devices like the Sony Xperia Z5 are capable of 4K, but this screen is about as insightful as they come. Rivals like the Samsung Galaxy S6 might offer a touch more sharpness, but it is balanced out by the 6S’s stunning colour palette and depth of detail that shows finesse where it matters. Hues are well balanced and natural, and while they’re cooler than the likes of the S6, they’re also more subtle and believable. Contrast is good too. Blacks will go slightly deeper on the S6 thanks to its OLED screen, but the iPhone has the overall better balance between deep blacks and bright whites, with plenty of detail left lurking in the shadows that lesser devices plunge into darkness. As ever, the proof is in the testing, and while a 1080p display or higher would be nice to have out of principle, this is a screen that more than holds its own against the higher specified competition. Sound has always been a strong area for Apple and this year, it’s better than ever. There’s still no high-res support, unlike Samsung and LG, but we’re always looking for the best core performance as a priority – and the iPhone 6S undoubtedly offers it. It’s a recognisable sound – tight timing, plenty of energy and the confidence to handle wide dynamic shifts with aplomb. All this, and we notice an improvement in tonal balance too. You’ll get detail at the top without the sound ever hardening up, and more low-end heft and solidity, without it swallowing up the rest of the frequency range. The midrange is as expressive and insightful as ever, with real clarity across vocals and instruments. When CD-quality tracks sound as good as this, we don’t find ourselves wanting for high-res audio, or feel like we’re missing out. There have been some decent upgrades to both cameras this year, including a jump to 12MP (from 8MP) for the main snapper and a boost for the FaceTime HD front-facing camera from 1.2MP to 5MP. The iPhone camera has always been a good one, but the boost in pixels tightens up your shots, adding a touch more sharpness and allowing for clearer zooms. Contrast is improved too, offering deeper blacks in strong light, while whites stay bright. Apple has always nailed its colour balance across the board, and it’s the case here too. Able to reach into the rich and vibrant when it needs to – with flowers or a blue sky for example – while keeping a firm handle on believability. When compared to something like the Samsung Galaxy S6, we tend to prefer the balance on the iPhone in most shots, though Samsung’s warmer palette is undeniably striking. However, the iPhone can’t quite keep up when it comes to low light shots. The iPhone’s f/2.2 lens is not quite able to compete with the S6’s brighter f/1.9, not to mention the lack of optical image stabilisation found in its bigger sibling. Keep a steady hand, and shots can be passable, but in dimly lit situations you might want to opt for the True Tone flash in order to capture skin tones more clearly. Speaking of flashes, iPhone has also included the Retina flash for the front-facing camera – a brief flash of light on the screen to brighten things up. It works pretty well, creating a soft, flattering light to get better selfies in lower light. A further addition to the camera this year is the ability to shoot in 4K, which will certainly offer sharper shooting but does seem to be more prone to shake from an unsteady hand. Unless you have real use for it, we’d stick to 1080p – if not only because it’ll take up nearly a third more space. If you’re not an Apple fan, the iPhone 6S is unlikely to win you over. There’s nothing revolutionary here, nothing that will suddenly turn your head to iOS. But what Apple is so good at, and what is so clear in the 6S, is its attention to detail – adding in clever features that work and upgrades that matter, all of which come together to deliver an experience that few can challenge. Are we won over by Apple’s latest handset? You bet. The iPhone 6S handset we reviewed was supplied by Three.